available to you that you will not know where to start first. There are two different design themes, butterflies and floral fans. Each of the themes comes with a large 4-block scene, 2 individual blocks, as well as 2 multi-part borders. All of these design elements can be combined to create a quilt of any size. 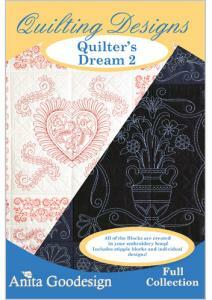 Each of the quilt blocks come in 4 sizes, so no matter which machine you have you can enjoy these designs. 148 designs total in two different design themes.